Tomato plants are warm season perennials grown by gardeners in many homes across the United States. They are easy to grow, and a few plants produce enough fruit to feed a large family. There are more than 100 varieties of tomatoes available to a home garden, classified according to shape, size, color, disease resistance, plant type and maturity season; choose one that meets your individual needs. Paste tomatoes are canned whole, or used in sauces, pastes and catsup. Processing them is simple because of their solid, low-moisture flesh. Originating from Poland, Opalka tomato, which usually takes 70 days to harvest, is preferred for sauces and pastes. This red tomato has almost no seeds and grows on a sturdy tall plant. Many apartment dwellers also grow the plant in a container indoors. Its sweet and refreshing flavor is perfect for making thick paste, or eating raw. Cherry tomatoes are suitable for small-space areas such as containers or hanging baskets. 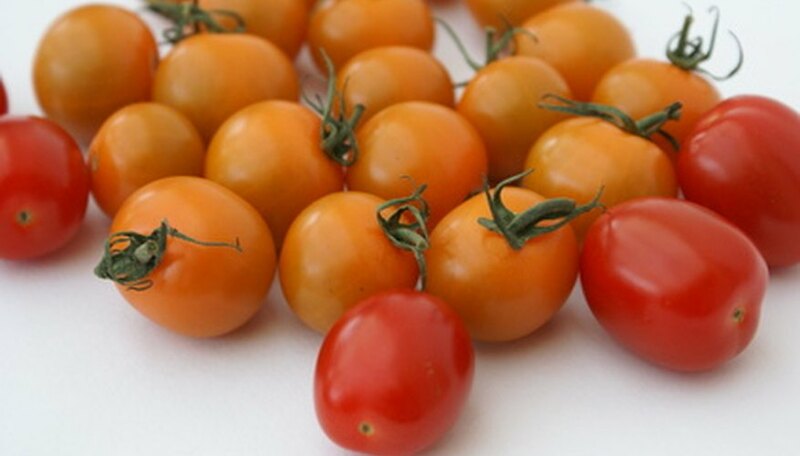 Sun Gold, which takes 55 days to harvest, is probably the best-tasting cherry tomato. This early tomato has dark golden flesh averaging 1 to 1 1/2 inches across and mimics the sweet, rich flavor of a full-size tomato. Tiny Tim, that takes 45 days to harvest, is another popular red cherry tomato variety with a rich taste. Tess’s Land Race is a tomato smaller in size than cherry tomatoes and was created by Bret Grohsgal from Maryland after two generations and five parent crosses. Taking 75 days to harvest, these intensely flavored tiny fruit's the size of peas are available in pink, dark red, gold and yellow. Making a brightly colored table display, only a few of these tomatoes are enough to add color and a burst of flavor to salads and savory dishes. It grows on a large plant that needs to be caged or staked to prevent it from spreading in all directions. Sudduth's Strain Brandywine is a large and meaty beefsteak tomato that is harvested in 85 days. Although there are many Brandywine varieties, Sudduth’s Strain has the richest flavor. This pink slicing tomato grows on a plant that does not crop heavily but makes up with its legendary quality and rich, juicy taste. Slice it in salads, simmer it for pastes, toss chunks of it in salads or pasta or grill it with meat or chicken.